I have a confession, I love puff pastry! This buttery and flaky pastry works equally well with sweet or savory dishes. And luckily it’s not that hard to make yourself. A little time consuming, yes. But you can definitely do it and it will surely impress your guests! In between folds you can take care of laundry, read a book, organise your pantry or go for a run. You can also do some other cooking experiment or have a friend over for wine. So roll up your sleeves and get ready to roll. Place all-purpose flour directly onto a flat surface, preferably a cold material such as a stone or stainless steel counter top. 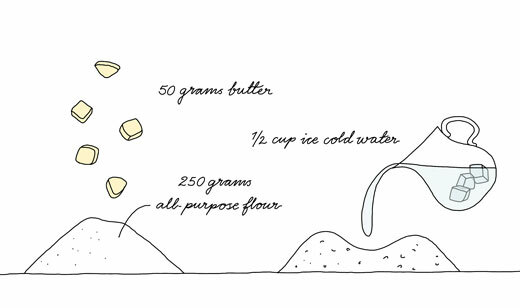 Cut 3.5 tablespoons (1.75 ounces, 50 grams) of the butter in smaller pieces and pinch the butter into the flour until you have a coarse crumb. Don’t over work, you should still have bits of butter in there. Make a well in the crumbly dough and poor in the ice cold water. Work together quickly and form a rough ball. Cover and refrigerate for at least 30 minutes. Shape the remaining butter, 10.5 tablespoons (5.25 ounces, 150 grams) into an approximately 5 inch (about 13 cm) square block. Wrap in plastic foil and refrigerate. Cut a deep cross in the dough ball. Fold every corner out and roll the dough with a rolling pin to an approximately 8 inch (20 cm) square. Place the butter block diagonally on top of the dough. 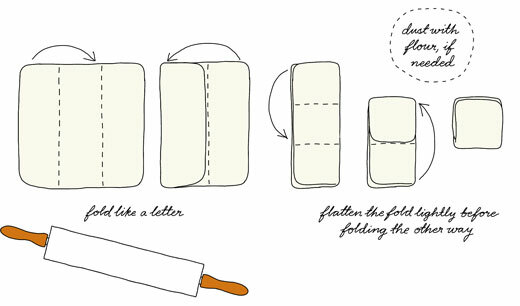 Fold every corner into the middle (without stretching), like folding an envelope. Pinch the seams together slightly. Turn the package up side down. Dust a little flour on both sides and roll it out carefully to approximately 12 inch (about 30 cm) square. Make a three fold (like folding a letter, see diagram). Flatten the fold slightly and fold a 2nd time the other way. Cover the dough and let rest in the fridge for 30 minutes. Roll the dough to approximately a 13 inch (33 cm) square. Make one 3 fold one way and another 3 fold the other way. Let rest in the fridge for 30 minutes. Repeat as in 3rd – 4th fold. Let the dough rest again for 30 minutes before using. If using it later, freeze in a well wrapped freezing bag, whole or in pieces with wax paper in between. * if your kitchen is very hot you will need to rest the dough in the fridge between every fold. Thanks Asli :). And I love Joulutorttu! Yours looks amazing. We make some every Christmas! Oh yes, it is a must for Christmas time, although I also make it frequently other times too because I just love them! 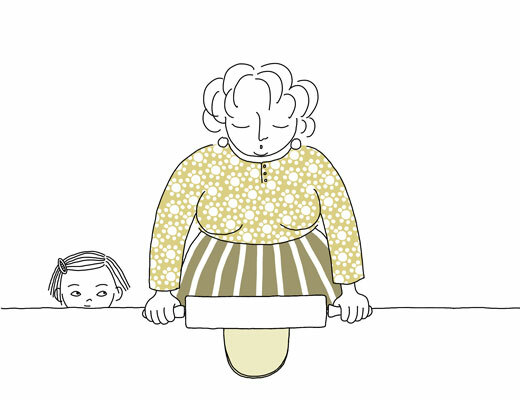 This is my first day see the blog in cute drawing illustration. Such a creative and neat blog. Great!